The Wandering Wind Tunnel is a complete stand alone, sub scale wind tunnel that is small enough to be transported on the back of a pick-up truck and large enough for meaningful data. Six students from Barberton High School were selected to work at NASA Lewis Research Center in Cleveland, Ohio for five weeks during the summer of 1994 to begin a research project that would lead them to both a practical and accurate design. They were then to build the small portable wind tunnel when returning to Barberton High School. The wind tunnel, when complete, will eventually travel around to area high schools for aerospace testing. It is hoped that it will be a catalyst for the application of computational fluid dynamics in the high schools and also provide valid data that can be electronically transferred while networking to other remote science classrooms. Educational Paper for Supercomputing 1995 The Wandering Wind Tunnel Project A project for the design and construction of a subsonic, small-scaled wind tunnel to be used to explain aerospace engineering fundamentals to pre-college students; the completed wind tunnel will be portable and will travel to Northern Ohio high school sites for data acquisition throughout the school year. The Wandering Wind Tunnel Project was initiated to provide a way for high school students to learn about aerodynamics and computational fluid dynamics through experimentation on a portable wind tunnel. The wind tunnel itself was designed to be a complete, stand-alone, sub-scale subsonic project; small enough to be transported on the back of a pick-up truck, but large enough for the production of meaningful data. The wind tunnel will provide data to the various Ohio high schools involved in the HPCC (High Performance Computing and Communications) K-12 pilot project, a program designed to bring technology into the science and mathematics classroom environment. The data collected will be analyzed on high performance computers funded by HPCC, and will provide an opportunity for data transfer among the schools through an electronic network. The design team, which planned and constructed the wind tunnel, consisted of six students from Barberton High School. The students initially involved in the project were: Todd Buxton, senior; Todd Fleet, sophomore; Nicholas Grinder, sophomore; Jeff Heilman, junior; Josh Humphrey, junior; and Davelene Israel, junior. James Mongiardo, a junior, also became involved with the project at a later date, when Nicholas Grinder moved to another school. These students were previously involved in a Supercomputing Program with Carol Hodanbosi, physics teacher at Barberton High School. The Supercomputing Program was also funded by HPCC and NASA Lewis Research Center as part of a K-12 pilot program. The project mentor was Dr. Colin Drummond, an aerospace research engineer at NASA Lewis Research Center, in Cleveland, Ohio. Funding for the project came from AIAA, (American Institute of Aeronautics and Astronautics), the northeastern Ohio branch, the NASA Lewis Research Center in Cleveland, Ohio, in conjunction with the HPCC K-12 pilot program, and OAI (Ohio Aerospace Institute). The wind tunnel is comprised of five main parts, listed in order from front to back: the settling chamber, the contraction cone, the test bed, the diffuser, and the fan housing with a variable speed motor. Also included will be an IBM 486SX computer, suitable software for air flow analysis, an A/D converter, a multiplexer, thermocouples, temperature and pressure probes, and a force balance model mount. The deciding factor for almost every component of the wind tunnel was the size of the test bed, which, in turn, is determined by the size of the object to be tested. The test bed is shown in figure 1. The entire wind tunnel had to be small enough to fit inside the bed of a pick-up truck while being transported. Based on this restriction, the test section was designed as 1' x 1' x 2'. The test section was made of 1 1/2" angle irons, and has three acrylic viewing windows. Each end of the test bed has 1 1/2" metal angle flanges to bolt to the other sections. The flanges allows for easy disassembly, another requirement for the portability of the wind tunnel. The second section of the wind tunnel designed was the contraction cone (figure 2), which proved to be the most difficult section as far as design and materials. The contraction cone's purpose is to take a large volume of low velocity air and reduce it to a small volume of high velocity air without creating turbulence. The size of the large end, nearest the settling chamber was set at 3.5' x 3.5'. Many of the ratios the design team used were selected with the guidance of the book "Low-Speed Wind Tunnel Testing" by William Rae, Jr and Alan Pope. The small end of the contraction cone was set at 1' x 1' to fit directly onto the test section. The shape of the contraction cone was a cubic curve, modeled after larger wind tunnels. 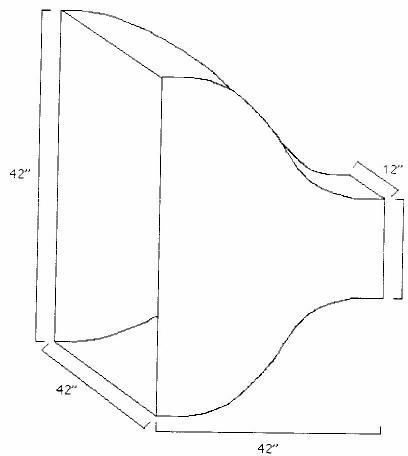 The contraction cone originally was designed to be made out of fiberglass, but due to difficulties involved with heating and molding it, it was decided by the group to be made out of 14 gauge sheet metal instead. The sheet metal also has metal flanges on each side to bolt together with the other sections. The settling chamber was designed after the contraction cone. This section is the front section of the wind tunnel and is placed onto the contraction cone (figure 3). The purpose of the settling chamber is to `straighten' the air flow as the wind tunnel draws air in from the surrounding air, channeling the ambient air. The settling chamber's cross section dimensions are 3.5' x 3.5', and match up with the dimensions of the contraction cone. It will be made out of 1/2" plywood and will have 1 1/2" angle irons as a flange to bolt it to the contraction cone. Its length is 21" to accommodate three different flow straightening devices. 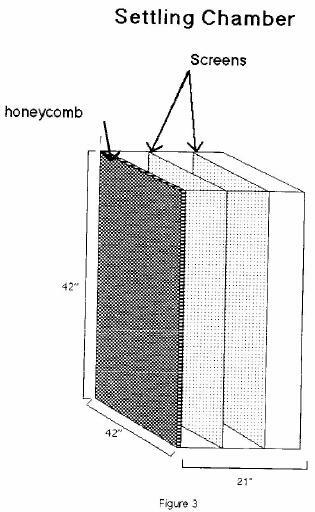 The first of the flow straightening devices is the honeycomb (figure 3). The honeycomb is a series of tubes laid lengthwise in the air stream. Its purpose is to allow the air to only enter in one direction, parallel to the airflow of the tunnel so that cross-flow velocities will not cause swirling winds in the tunnel. The design team decided upon 1/8" diameter straws cut into 1" pieces for their honeycomb. The straws will be placed at the very front of the settling chamber, aligned parallel to the air flow and held in place by double-sided masking tape. The second and third flow-straightening devices are screens (figure 3). Their purpose is to make the velocities of the wind in the wind tunnel equal by eliminating fast and slow air velocities. As the air passes through the screens, the resulting drop in pressure across the screen creates constant air speed in the tunnel. The two screens will be approximately 6" apart from each other and will be placed 6" behind the honeycomb. All three of the flow straighteners will be removable for easy cleaning and maintenance. 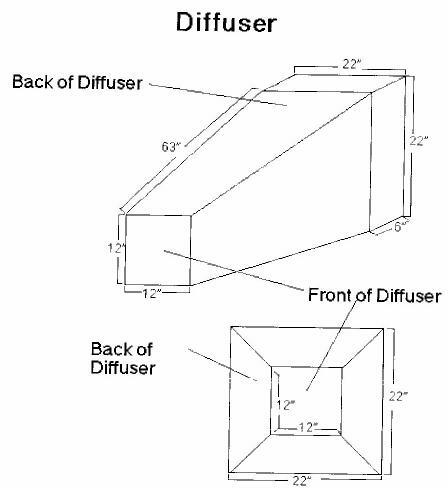 The diffuser section (figure 4) of the wind tunnel is necessary to reduce any air turbulence that could lead back into the test section. The angle of the diffuser is based on a ratio of surface area of the end of the diffuser to the surface area of the front of the diffuser. The dimensions of the front opening are 12" x 12" and the dimensions of the end opening are 22" x 22". This gives a ratio of 3.36 to 1. Using this ratio, the angle of the diffuser was set at 4.8 degrees. The diffuser is 63" long and will connect to the test section with flanges similar to the ones used to join the test section and the contraction cone. 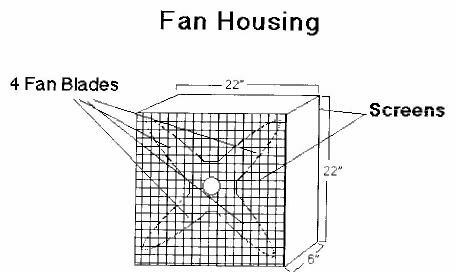 Following the diffuser is a fan housing (figure 5) to hold a four blade fan controlled by a variable speed motor. The fan housing will be 25" x 25" wide and 6" in length. 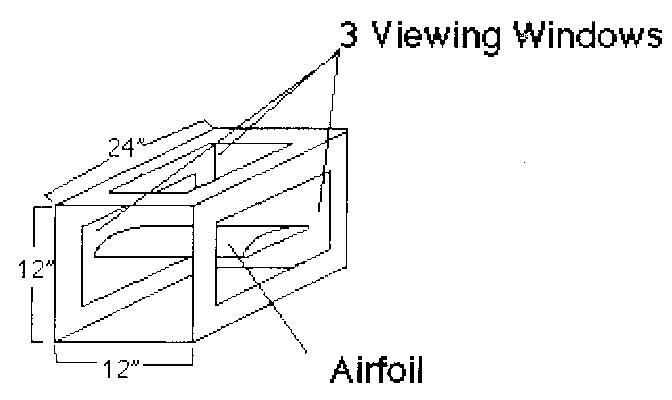 The fan will have two screens, one in front and one in back, for safety purposes. The motor will be mounted on a stand with rubber pads (figure 6) to reduce the amount of vibration on the wind tunnel. 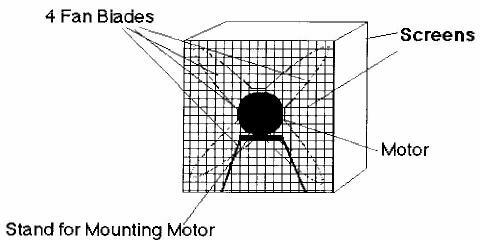 The main types of test data in any wind tunnel are lift and drag. The design team used a sting and thrust balance system to measure the effects of lift and drag on their models. Lift and drag are measured by using a series of springs, a pivot, and a strain gauge, which are all part of the thrust balance system. When the air passes over the model, the pivots and springs create a tighter or looser strain on the gauge. Strain gauge sensors electrically respond to the change and to its intensities, and send an voltage change to the A/D board. The A/D board converts the electric signal into a digital computer language. The computer collecting the data will be an IBM 486SX, with sixteen input channels. Total and static pressure readings will be another important source of data. This data provides a way to find the true air velocity in the tunnel. The wind tunnel will have four pitot tubes, which will be able to measure static pressure and total pressure. By substituting in appropriate pressure-velocity equations, one can determine the velocity from the two pressures. true air speed = square root of ((2 x dynamic pressure) / air density) dynamic pressure is measured in pounds / square foot air density is measured in slugs / cubic foot Flow patterns are the most easily viewed test. The design team plan on using smoke, tufts, and paint to visualize flow patterns in the wind tunnel. Smoke will be used to show turbulence around the model. Paint and tufts will be the least expensive and most effective way to illustrate flow on the surface. Air foils of various designs will be used in the wind tunnel. Student projects in science and physics classes could design airfoils from various airplanes. Additional experiments such as dimpled versus non-dimpled golf balls and small models of automobiles and downhill skiers have been considered. The sting, which is the support for the models, will be adaptable to almost any model. Proper placement of the sting and model in the test bed will be essential to quality data collection. In addition to the sting placement, there are also proper component placements. The pressure rakes, pitot tubes, thermocouples, and thermometer probes must be placed in way to avoid disturbing the air flow. An analog to digital (A/D) sixteen channel, 100 kHz converter board, a terminal connector, and a multiplexer are necessary in the data collection process. Appropriate flow analysis software will be selected that is simple to operate, has a large range of functions, and that also has graphic display capabilities. The five important measurements that need to be found in the low speed wind tunnel are dynamic pressure, static pressure, total pressure, temperature and turbulence. Thermocouples, temperature probes, pressure rakes, pitot tubes and a force balance on the mounting sting are required for the wind tunnel to generate accurate data. Since this machinery will involve the active participation of high school students, safety is an important factor. To ensure the safety of the individuals operating the wind tunnel there will be screens located in front of and behind the fan. This feature will not only protect the operator, but will also keep the test model from being destroyed by the fan if it slides from its mounting and out of the test section. Protective caps will be placed on the front of the settling chamber and the back of the motor during transportation and periods of low use will lower the amount of dust build up. A keyed switch will be on the wind tunnel motor so that it cannot be operated without supervision. Another very important feature of the wind tunnel is the emergency stop wire. This wire will run along the outsides of the tunnel and in cases of emergency it can be pulled. The stop wire will be attached to a shut off switch to automatically stop the fan. The wind tunnel project was and will continue to be a learning experience for all the participants. During this project, the design team learned that responsibility and teamwork was important for the wind tunnel to be properly designed and built. At first, it was difficult for the six high school students to learn to compromise. Each had their own ideas and had to learn to listen to other opinions that had equal merit. Eventually, however, they learned to value each member's contribution and worked together well. Another important aspect of this project was the contribution of expertise of several of the students' parents. The summer internship gave each of the students invaluable real world experiences that included; economics, time constraints, size and weight restrictions on the design itself, cooperative interaction,interrogation of researchers for important information, and finally, after all the research was done, critical decision-making. At this time, the wind tunnel is nearly complete. The design team has finished most of the important sections, with only one section remaining. The metal shop class has recently made the motor stand and mount from the team's specifications. The A/D apparatus, pressure and temperature probes have been installed and work correctly.The team has to find a way to reverse the direction of the fan blades (it was designed to exhale not inhale) and still attach to the motor. A new metal sleeve must be made for the attachment of the blades to the motor. Plans for the 1995-96 year will include the following projects: Physical science and physics classes, along with two fourth grade classes will work cooperatively to develop experiments for the wind tunnel. Together they will test existing objects that they may choose, such as golf balls and model cars and planes. They will also design shapes from modeling clay to be placed in the test bed. Sensors located in the test section are connected to a computer, whose software is designed to analyze various air flow patterns. The students will use the data derived from these experiments to predict how other objects will behave in the wind tunnel. They will research how air temperature, air density, humidity, air speed, and the geometry of the objects affect the air flow. Based on the results of the experiments, they will make generalizations about good aerodynamic design. The data that they derive from this activity can be sent via the internet to other schools interested in acquiring flow data. After Barberton High School has completed its tests, the wind tunnel will 'wander' to other sites for further experimentation. The wind tunnel hopefully will become a catalyst for creativity, with each school creating their own models and experiments for data acquistion. Bibliography Rae Jr., William H. and Pope, Alan. Low-Speed Wind Tunnel Testing. New York,Wiley & Sons, 1984, pages 37-119,126-141,153-183.